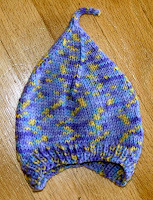 Fiber Trends (CH-34) Ear Cozies hat made for new baby Jayden. I made it in the Medium size with Ella Rae Classic Print in color 203, 100% wool. It was a quick knit and as usual turned out gorgeous. It is all wrapped up and ready to present to Grandma today for delivery. I'm not sure whose bright idea this was to begin with - but it sure is a lot of work. Chris and I are switching rooms. 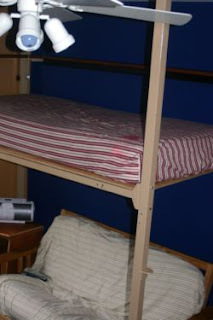 He is getting what was my sewing/craft room in the basement, and I am getting his bedroom upstairs on the main floor. It will be nice to have the boys further apart and Chris goes to bed earlier than everyone else so will get more quiet at night... but so much work! 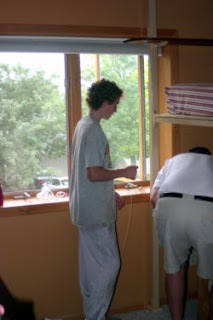 His new room downstairs has been completely emptied, repainted and furniture moved in. I still have one cabinet with items in it but he should be ready to fully unpack and get settled. My new "activities" room upstairs? Well, let's just say almost everything is in there - but it's not even remotely close to being organized. I got rid of 5 huge garbage bags full of "treasures" and there's still a lot of items. I'm hopeful that the close proximity to the living area and our bedroom will enable me to get more time in the room to accomplish things. There's material I bought to make the boys clothes back when they were itty bitty that just never got done. Not to mention all the quilt materials, stained glass, painting, polar fleece, yarn. I need to get crackin' and produce some stuff out of all that stuff. Sorry it's been so long! Things are busy busy busy this summer - of course that's pretty normal around here. On July 11th our "baby" turned 13. THIRTEEN! How did that happen??? My brother (from Idaho)was in town for a visit and we got to celebrate Chris' birthday with him and the 4 gorgeous women in his life. It was great to have little ones splashing and having fun in the pool and to get cake and ice cream all over their faces. Ahhhhhh - there is nothing like a week at the cabin. We were blessed with lots of sunshine and blue skies. We even were treated with a daily visit from our lake's resident swans and their 6 babies. We spent many hours lounging outside with friends and with just our immediate family. We watched Drake "fish" for hours and swim with the boys. We even did a little celebrating on July 4th with our cabin neighbors and others on the lake who shared their own firework displays. 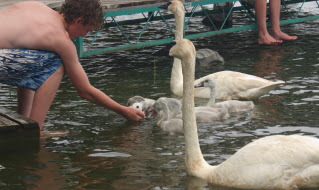 The picture is of Tom sitting on our steps down to the lake, feeding the swans some corn right from his hand. They also love bread. 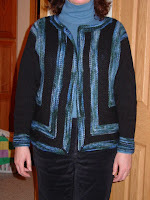 I read 3 books and finished the left side of my 2 button jacket. The right side is just a few short cm from being completed. Then it is on to the sleeves and collar and I'll be ready to wear it! My brother has decided his office is really his office, not a server room. As a result, our website hosting has been moved to go daddy DOT com. You should be able to see the amsden DOT net page there with no problems. Now to find the time to update that old webpage! I went to do laundry last night and discovered that our front loading washing machine had decided it didn't want to lock the door and spin out on high anymore. Looking on the bright side, I decided it was the perfect time to get Amanda's Squatty Sidekick felted since I could now open the door whenever I wanted and it would never spin a silly crease in the side. Here's the results. It is about 11 1/2 inches wide by 5 1/2 inches high and then 4 1/2 inches deep. I am overall pleased with it, I will definitely make another one and plan out the decreases a little better if I double the depth of the bottom again. The one side seems to have had more decreases than the other and pulls in toward the handle more severely. I was a little concerned about the short handle going around my arm so I have "hung" it to dry. I'm sure it will take days and days with this humid and hot MN weather! Lamb's Pride Worsted in M-160 Dynamite Blue from Denise's Brown Sheep shopping trip. I still have about 1/2 the skein! I was planning a relaxing weekend.... I wound up leaving the cabin with youngest son shortly after 4:00 on Saturday headed to the ER. He and his older brother were on the jet ski and flew off and he tried to plant his face in the front hood. He has a gash on his chin, a sore nose and neck and managed to ram his two front teeth about 1/8 inch up into the bone that separates the teeth and nose. Fun huh! We got to the ER around 5:00.... they put him in a neck brace and did a CAT scan and XRays, then left there at 9:40 pm for the Oral Surgery Center where the oral surgeon agreed to come in and do surgery on him that night. (What a doc!) We got home just before 1:00 am. He's now on heavy pain medication but no black eyes yet and the wire on his braces is again straight. His nose and upper lip aren't as swollen this morning so that's good. He can't chew anything harder than cooked pasta for 6 weeks, preferably all liquids for the first few days. With the super glue on his chin for his gash there, no swimming or baths for 5-10 days until the glue is totally worn off. On Friday a friend and I took a little road trip at lunch and went to a LYS that is moving locations and having a sale. I found this pattern and the exact number of skeins of yarn I needed all for 75% off. I sure hope there aren't any surprises because there is no more yarn where this came from. The yarn is Colourworks in yellows and oranges (shade 996), 100% Pure NZ Wool Hand Painted by Jan Gilray. I little brighter than I normally would pick but I thought it looked fun. They recommended alternating between 2 skeins every 2 rows to keep the color consistent so that's what I'm doing. So far I haven't had too many tangles. I have 10 inches of the back done after working on it this weekend. When I get to 13.5 inches I need to start decreasing for the arms. Last Saturday I drove 7 hours, round trip, for a wedding shower for my cousin. Mom, Grandma, my niece and my Aunt (Mother of the Bride) were all in the car so it was a great chance to catch up and have some time away. I cast on this cute little felted purse soon after leaving my house, and had all but the button flap done when I arrived back home. I finished the button flap one day last week and found a button at the LYS on Friday. Now.... to find the chance to go see if Mom will let me felt it in her top loading washer. The yarn is the gorgeous royal blue Lamb's Pride from Denise's shopping trip for me (1.5 skeins). The pattern is by Amanda Berka and is available from Knitting Daily by Interweave Press. The original bag is suppose to be 4.5 inches high, 10 inches long and 2 inches wide with a 14 inch handle. I made the bag bottom twice as many stitches wide so I'm hoping it's more like 4 inches wide. My Knitting Parents yahoo group has this wonderful woman who offers to shop for us whenever she visits her parents. They live near the Lambs Pride factory in Nebraska where you can buy their yarn for $12 per pound. I took the plunge this time and asked for 4 pounds of yarn... this is what was in the fantastic box I opened today at work. The bottom skeins are worsted weight of their regular yarn... the top skeins are worsted weight in super wash. Now... what project to start on! The prayer shawl is complete, including a trip through the washer and dryer with a load of clothes. No special care was taken (on purpose) and it looks fantastic. I think it will handle what the intended young man can dish out with no problems. Have you ever had someone ask you to do something for them and since they asked 5 months before you had to have it completed, you said "Absolutely". Then you procrastinated until maybe 2 weeks before? um, yeah - me too! Our church gives each High School senior a prayer shawl from our congregation. This one is for a male. It is grey with a green cast to it. It seems to change color in different lights and keeps me wondering. My eldest son advised me to make it wider than the pattern for the traditional "shawl" so that the recipient could use it as a lap blanket if he wanted to. I'm using a double strand of ella rae Amity in color number 20. This finished portion has used up 2 balls of the yarn. I would like it about 4 times as large so I better get knitting! The size 15mm needles sure help speed things along! It is currently 15 by 40 inches - approximately. Original email from church said to use Lion Brand homespun and size 11 (US) needles, I'm making it this year with a double strand of worsted and NOT homespun. Socks (Barely There) all done! 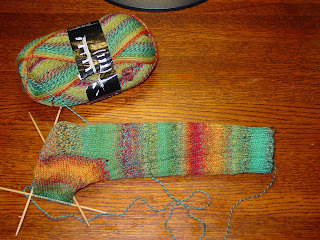 The socks are completely done... the one (right) is grafting but not pulled tight enough. The other one (left) is grafting pulled tighter and with the firststitch on the end of each needle slipped over the one next to it. I can't really tell the difference but I think the one I decreased on each end looks better. They are drying now, I can't wait to see what they look like after wearing and washing in the machine once. 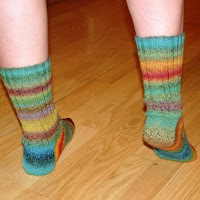 The pattern is from the Knitting Pattern a day calendar, the May 1st 2007 entry for Barely There Socks by Jill Schaefer. I used Lorna's Laces Shepherd Sock (80% Superwash Wool, 20% Nylon) in Chino colorway. They should be washable so I hope I don't wind up with a pair of baby booties when they get washed by him. The toe is grafted, instead of the 3 needle bind off but it looks a little strange. I'm sure the 3 needle would have been the same but I'm not quite sure what I would have done differently. Now... 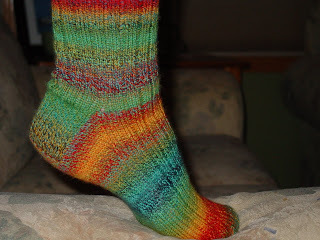 I better cast on for that second sock or it will never get done! I wanted some different stitch markers, but couldn't really find what I wanted for the price I was willing to pay. One quick trip to Hobby Lobby and the next day I had these! I still have more beads but didn't want to get too crazy! I put a small jump ring on one end, and a larger on the other. Now I can use them for a lot of different sized needles. I'm trying to do a little catching up today. This is the Fiber Trends pattern (CH-34) called Ear Cozies. I made it with Katia yarn (washable wool) in a size medium (1-2 years). The gaugue is a little off so it is larger than it should be but it should fit the intended giftee perfectly. This is a shot of it AFTER it was washed and dried with a load of clothes. I love stuff that comes out looking this great with no special care! I'm so glad Christine recommended it - there's no way I would have purchased the pattern after seeing the picture that came with it. It is MUCH cuter when knitted up than the picture on the pattern. These shots were taken by our eldest son on April 8th. We have a split entry house that has a large transom window over the front door. We were sitting on the top steps in the house, watching the finches on the transom window sill. They in turn, were chatting with each other and watching us. One year they even built a nest in the corner of this window and we were thrilled to watch the babies hatch and then grow to leave the nest. 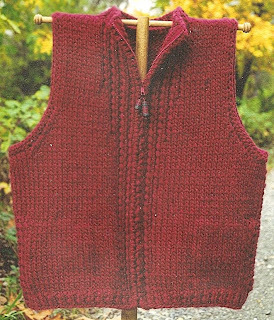 I signed up for another class at my LYS... the Oregon Vest by Oat Couture natural knitting. I am really liking it! 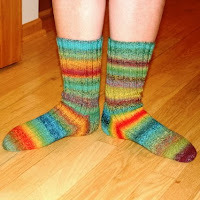 The pattern is written for 3 weights of yarn, Worsted, Bulky or Super Bulky. My goal is for this vest to stay in the car when we are traveling around this summer and be used for those runs into the hockey arena for youngest son's games. I wanted to use chunky yarn for warmth, but wanted easy washability so I wouldn't be upset if it gets smooshed in between hockey equipment in the back of the truck. I chose ella rae Amity yarn in a pretty midnight blue (color 20). I have the back complete and 10 inches of the left front. I'm really liking the twisted rib stitch, it's amazing what knitting in the back of the stitch will do for the look of rib. The two big reasons I took the class is because we are going to learn how to put in a zipper... and pockets on a side seam. There are 3 vests made in different sizes at the store, one of them has cloth for the pockets instead of knitted fabric. I'm going to try that version.... I'm concerned about keys and things going through the fabric in knitted pockets, not to mention a triple layer of bulky knitted fabric right at my stomach/hip area. Yesterday a friend (Kim) and I got to leave work early (YEAH!) and drive to St. Paul, MN and attend the Yarn Harlot's talk for her book launch of Cast Off. That's a shot of Stephanie taking "sock pictures" of the crowd. After touring the yarn store, and thanking the wonderful people there for putting this all together, Kim and I walked a block back and visited the Bead Monkey. Oh my, I actually found myself putting things in a little tray to buy so I could start doing beads! WHAT was I THINKING?!? Sanity prevailed and I didn't buy anything but goodness there was gorgeous stuff there! A bead stash would definitely be fun to build and easier to hide than yarn. We then stopped for coffee and conversation in the Bread and Chocolate place nearby and then walked over to the auditorium where the Yarn Harlot would speak. We met up with Gail (from my Knitting Parents Yahoo group) and her friend Sally - then got in line and chatted until the doors opened. I was a little anxious about them trying to check in 400 people but the Yarnery pulled it all off quickly and without a hitch again. We were seated and knitting within 10 minutes of the doors opening and we were probably 30 people back in line. Nice job Yarnery! Mitred Jacket is finished - well almost! Just as soon as I find those buttons I bought those many weeks (or is it months) ago, I'll get those sewn on and it really will be finished. Buttons or not, I'm wearing it tomorrow when I meet Gail (from my Knitting Parents Yahoo group) and the YARN HARLOT! I'm so excited.... an entire afternoon and evening of knitterly fun! In 2000 I started cutting my hair shorter and shorter - it got so it was shaved in the back and the longest hair was under 2" long. 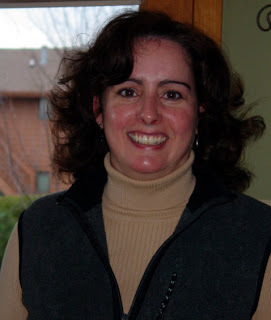 I had shorter hair than my sons! ;-) Two summers ago I decided it might be fun to grow it out and try some new hairstyles again. ARGH... what was I thinking? Ok, it is kinda fun to be able to put it up under a baseball cap, or in a pony tail... and it is almost long enough to all go up in one ponytail in the back. I had totally forgotten how much fun it is to put your purse or bag over your shoulder and pull your own hair, or to go outside and have the wind blow your hair in your mouth and eyes so you have to use one hand to clear your face to make sure you cross the street safely. I'm not sure how long it will last - but it's long again. My hubby and kids love it. I haven't decided yet. 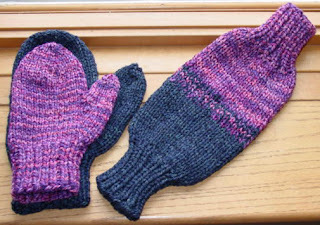 I have finished the Smitten and matching Mittens for a friend at work. I did "His" side of the smitten in blue and "Her" side in a purpley/pink mix. The mittens match their side of the smitten. The yarn I used was Cherry Tree Hill yarn (Twister?) in 75% Merino Wool and 25% Superwash. I used 1/2 a hank of each color. The Smitten pattern is from One-Skein Wonders and the mittens are from Knitters Handy Book of Patterns. I hadn't used the Knitters Handy Book of Patterns since I got it.... it seemed a little too complicated for a very beginning knitter. I've since looked at it again and can't believe I haven't used it before now. It's wonderful!